Purpose: Perform any action their master and leader programmed into them to achieve the love of Wanda Maximoff and his revenge against Magneto and Quicksilver. History: (Vision and Scarlet Witch II#6 (fb) - BTS) - Toad, once in love with the Scarlet Witch, having learned that the Vision and Wanda would have a baby, decided to take his revenge against them. Using the incredibly advanced devices he had stolen from the Stranger, Toad created some synthetic replicas of some members of the Brotherhood of Evil Mutants. Synthozoid copies of Magneto, Mastermind and Quicksilver were created, capable of thinking, acting and fighting as their original, human counterparts. Toad named his group the Brotherhood of Evil Mutants, like the original one. (Vision and Scarlet Witch II#6 - BTS) - After months of preparation, ready for his revenge, determined to kidnap the Scarlet Witch, the Brotherhood approached the Vision and Wanda's house in Leonia. It was Thanksgiving's Day, and many super-heroes were gathered in the house so Toad didn't attack immediately. (Vision and Scarlet Witch II#6) - Later, after dinner, Captain America, Namor, the Wasp and Doctor Strange left the house. 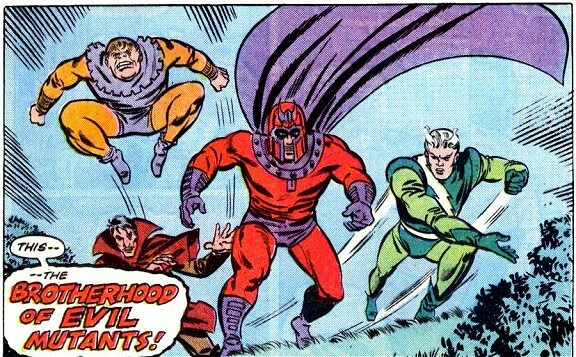 Also the original Magneto left the house but he luckily spotted the unexpected, dangerous group lurking in the woods. So, after some minutes the Brotherhood was forced to confront the little group gathered by Magneto, including the real Quicksilver and the Vision. The replicas proved to be as powerful as their original counterparts, and the fight was at a stalemate, but the Vision, thanks to his databanks, understood that Toad could have used the same device he had used once against the Avengers. The Vision had Magneto stun Toad and immediately after, all the replicas fell to the ground, unconscious. But Toad was not defeated. While the heroes were inquiring him, he used the Stranger's ship to envelope himself with a protective energy shield. He called back his synthetic pawns, to let them enter the protective field but was struck from behind by the real Quicksilver, who had changed his costume with his synthetic double. Toad was knocked out, and so was the rest of his Brotherhood. (Vision and Scarlet Witch II#7) - After their defeat, the Brotherhood members were taken captive to Project: PEGASUS. Toad was imprisoned and the three Synthozoids were dismantled. However, Mastermind's programming triggered a transformation in its form. Despite the presence of the Vision, who broke it into pieces, the Mastermind's legs managed to escape from the laboratory and reached Toad's cell, freeing him. Toad escaped, helped again by the energy field of the Stranger's spaceship. The Vision followed him on the spaceship and after a fight left the ship in the outer space. It was damaged, without control, with Toad still inside. Comments: Created by Steve Englehart (writer), Richard Howell (pencils), Frank Springer (inks). Toad had the power to create a lot of other evil mutants to support his cause, but he did not. He probably wished to re-create the original Brotherhood, with himself as a ruler, and Wanda (the real Wanda, not a Synthozoid) at his flank. Marvel Two-in-One#68 has a Thing/Angel story in which they battle the Toad, who has an artificial Scarlet Witch with him. but has no known connections to any other "Brotherhood" of "Brother". The synthetic Mastermind was a complex machine of humanoid shape, a Synthozoid, an Irata 800 X-L matrix model 20-2. Its purposes were programmed in his artificial memory. It probably had the same powers and personality as the original Mastermind, Jason Wyngarde. To perform his task it needed to eat the power decay of a substance it called Unnilnonium 214. He had months of training in the use of his powers. It also had the ability to transform its body, as pre-programmed by its master, Toad-King. 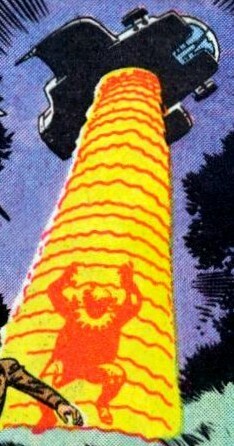 After the transformation, its dimensions were doubled and his energy flowing in its internal part was pure anti-matter. It was able to function even if broken in several parts. However, he could perform actions only when Toad was conscious because, as the other Synthozoids, lacked an independent mind. (Vision and Scarlet Witch II#7 (fb) - BTS) - Toad knew that if his first attack to Wanda and the Vision had failed, his Brotherhood would have been imprisoned in the Project: PEGASUS, so he pre-programmed the Mastermind Synthozoid to activate its secondary form after a full cycle of the moon, and perform immediately the task to free its master. (Vision and Scarlet Witch II#7) - During the battle in Leonia against the heroes, the Mastermind replica used its illusions to envelope enemies and allies. Only the Vision could compute something different from what everybody saw so he was able to catch Toad. Seconds later Mastermind fainted, or was deactivated, when Toad was driven unconscious by Magneto. (Vision and Scarlet Witch II#7) - The Brotherhood members were taken to the Project: PEGASUS. The scientists removed the "illusion" power from Mastermind but its dismantlement was only at the beginning. Its program triggered the transformation. The Vision was visiting the Project and tried to stop the Synthozoid. Mastermind was broken in pieces but its legs succeeded in performing its primary objective, reaching Toad's cell and deactivating the energy bars, liberating its master. When Mastermind touched the energy bars of the jail, the Synthozoid was disintegrated. The synthetic Magneto was a complex machine of humanoid shape, a Synthozoid, an Irata 800 X-L matrix model 20-2. Its purposes were programmed in his artificial memory. It probably had the same powers and personality of the original Magneto. To perform his task it needed to eat the power decay of a substance it called Unnilnonium 214. He trained in using his powers for months. However, he could perform actions only when Toad was conscious. (Vision and Scarlet Witch II#6) - During his battle against Magnus "Magneto", the replica hold his ground, defending himself from the more experienced Homo Superior Magneto and also taking him at bay. He fainted, or deactivated, when Toad was driven unconscious for some seconds by Magneto. (Vision and Scarlet Witch II#7 - BTS) - The Brotherhood members were taken to the Project: PEGASUS and Magneto was dismantled. The synthetic Quicksilver was a complex machine of humanoid shape, a Synthozoid, an Irata 800 X-L matrix model 20-2. Its purposes were programmed in his artificial memory. It probably had the same powers and personality of the original Quicksilver. To perform his task it needed to eat the power decay of a substance it called Unnilnonium 214. He trained in using his powers for months. However, he could perform actions only when Toad was conscious. (Vision and Scarlet Witch II#6) - The Synthozoid speedster managed to fell Quicksilver, who was really surprised in that moment. The synthetic Quicksilver didn't succeed in hitting the slow-dense Vision, but tried to vibrate his body to become as ephemeral as his Avenger enemy. Unfortunately for him, he could not pass through the Vision's diamond-hard body, smashing hard into him. Then he fainted, or deactivated, when Toad was driven unconscious for some seconds by Magneto. 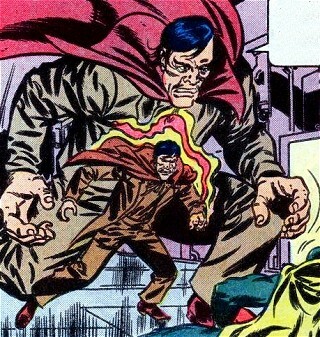 His costume was stolen and used by the real Quicksilver, to infiltrate in Toad's energy shield and knock him out. (Vision and Scarlet Witch II#7) - The Brotherhood members were taken to the Project: PEGASUS and the Quicksilver Synthozoid was dismantled and studied by the researchers.